The conservation easement is an effective and flexible technique for land preservation. The Conservation Easement in California, written by California attorneys expert in conservation law for The Trust for Public Land, is an authoritative legal handbook for the use of conservation easements in California. 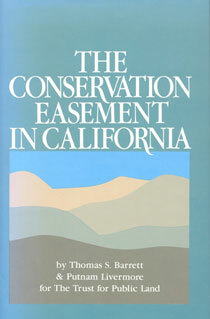 This book puts the conservation easement in context, discusses the historical and legal background of the conservation easement in California, its state and federal tax implications and the problems involved in drafting easements. Of special importance is the book's clear exposition of the statutory distinction between conservation and open space easements, which should be especially helpful to land trusts and public agencies at all levels who want to put these innovative techniques into practise.